When it comes to lasagna I am like Garfield, I can easily devour the entire thing single-handedly and will give the angry stare to anyone who approaches me during this process. Joking aside though, I love lasagna, and I mean, who doesn’t? It’s the perfect comfort food, and served with a nice side salad (or any other compatible side-dish) it can be eaten during the weekdays or as a festive dish. 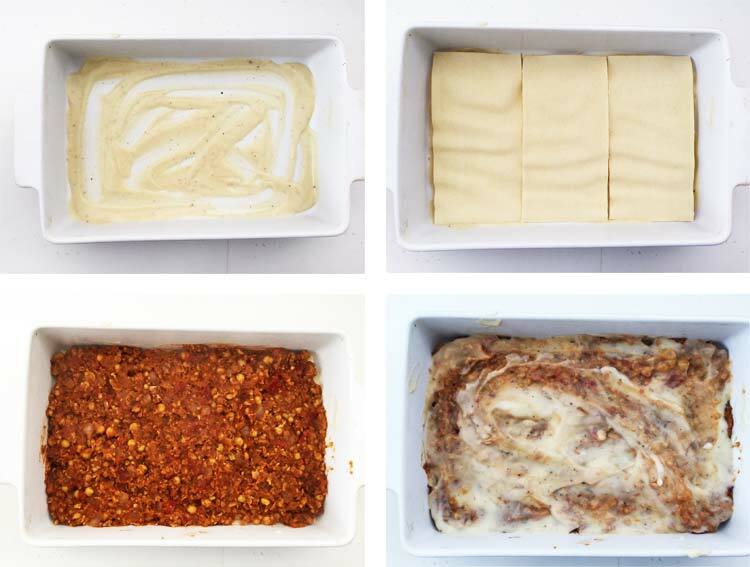 Making a vegan lasagna is not hard at all either. You can use normal lasagna noodles/plates/sheets. Just make sure that they are egg-free (if you want to be strict). If you have your own vegan bolognese recipe, good for you! Then you only need to prepare the bechamel sauce, assemble and bake. Now, for those of you who don’t have a vegan bolognese recipe in hand, I can really recommend this one I do here. You can serve this with pasta as well, but I especially like it in lasagna. The “meaty” base comes from chickpeas which are mashed gently with a potato-stomp. 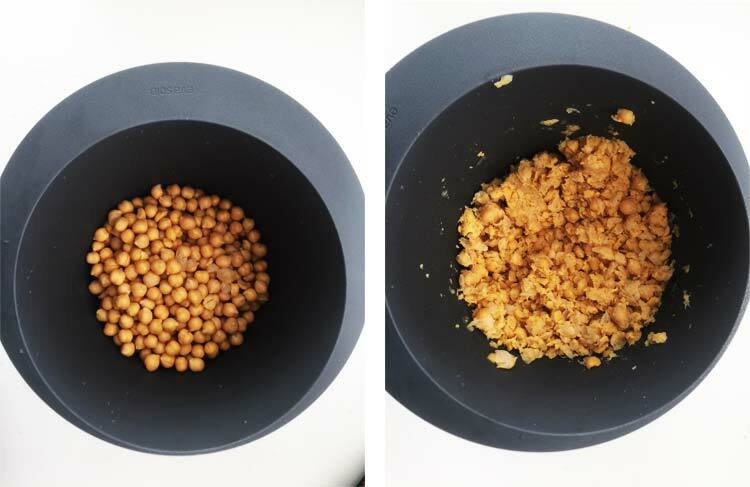 Chickpeas are a great way to increase your intake of fibre, calcium, iron, phosphate, magnesium, zinc and vitamin K.
Rinse the chickpeas, save the chickpea water (also known as aquafaba) it’s great for baking and works as an egg-replacer, then mash them gently with a potato-stomp or a fork. Set the chickpeas aside, and continue with dicing the onion and garlic. Bring out a large saucepan and heat up the olive oil and start to saute the onion and garlic for a couple of minutes until the onion is soft and starts to be a little bit translucent. Add the chickpea mash and continue to saute for another 3 minutes before adding the crushed tomatoes. Bring the sauce to a boil, lower the heat and add the spices, liquid aminos, nutritional yeast and let simmer for about 20 minutes. While the sauce is simmering, preheat the oven to 220 °C / 430 °F / Gas Mark 7, and bring out a small saucepan. It’s time to start preparing the bechamel sauce. Start out by melting the butter and then add the flour while you whisk the mixture, creating a somewhat smooth dough. Continue to whisk while you pour in the soy milk and whisk until the flour and butter mixture is dissolved. Add the spices and continue to stir. After a while, the sauce will thicken and once it’s a little bit looser than you want it, remove it from the heat, as it will stiffen a little bit when it cools off. Now that you have your chickpea filling and bechamel sauce ready it is high time for you to start assembling your vegan lasagna. Start out by taking out your oven safe form. Add a little bit of bechamel sauce to the bottom of the form and then place some lasagna noodles on top. I found a brand that makes sheets that fits my form precisely, otherwise, you can just break them up so that you cover the area of the form. Add some chickpea filling and then top it off with more bechamel sauce. Lay out another layer of lasagna noodles and repeat this process for as many layers as you want. I made two layers. When you’re finished you add the last bit of bechamel sauce you have to the top layer and sprinkle some (optional) vegan cheese on top. Bake the lasagna in the oven for about 20 minutes. Serve the vegan lasagna with some salad on the side! A comforting lasagna stuffed with chickpea mash that will melt in your mouth. Perfect for a mid-week dinner or as a festive weekend treat. It is very versatile. Rinse the chickpeas and mash them with a potato-stomp or fork. Set aside. Heat up the olive oil in a large saucepan and saute the onion and garlic for about 3-4 minutes. Add the chickpeas and saute for another two minutes. Add the crushed tomatoes and spices. Bring to a boil, lower the heat, cover and let simmer for about 10 minutes, stirring occasionally to prevent it from sticking in the bottom. Pre-heat the oven to 220 °C / 430 °F / Gas Mark 7. In a medium saucepan melt the butter. Stir in the flour to create a smooth dough. Pour in the soy milk and stir so that the flour and butter mixture dissolves. Lower the heat and continue to stir until the sauce thickens. Add salt, pepper and nutmeg and stir again. Remove from heat and let rest. 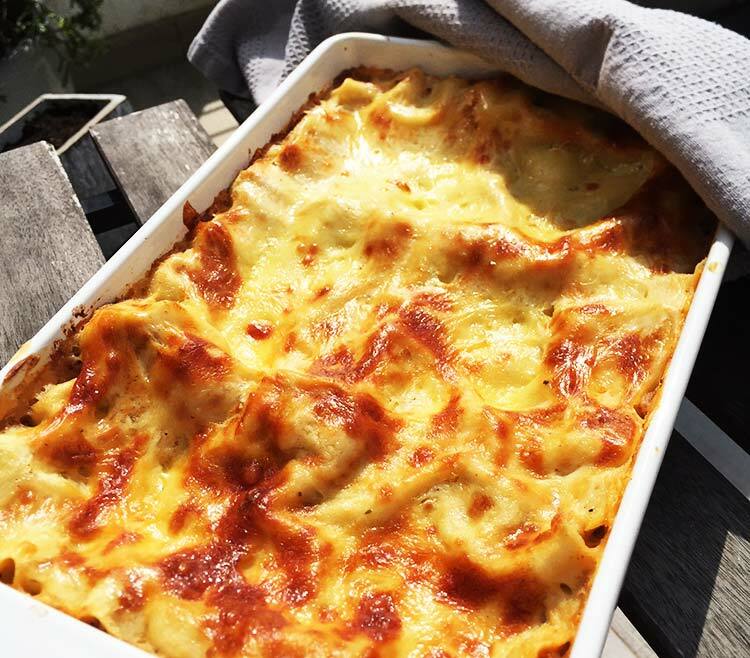 Assemble the lasagna by adding some bechamel sauce to the bottom of an oven form, then add lasagna noodles, chickpea mash and bechamel sauce. Repeat this process for as many layers as you want. 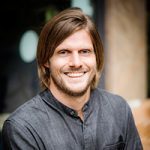 Bravo Olle! For an Italian who’s recently turned vegan, this is the kind of finding that can make your day! It did make my weekend though ;). I’m just not sure about that 20 minutes preparation time (it took me 19 minutes just to chop the onion ;)). Well, I just need to work on my speed. Overall, great job! Thanks for sharing! I am so glad you liked it! And coming from an Italian as well makes it all even better :).